As I get older, I get more interested in the history that came before me. This might be because I now have a little bit of history to share with the world myself or maybe I’m just becoming more curious in things that actually matter instead of the typical teenage and twenty-something drama. Recently, I went down one of those endless rabbit-holes the internet provides. The severe weather warning sirens had gone off in my dorm, that brought about me telling my roommate about the Buffalo Lake tornado and I couldn’t remember what year it was, so naturally I googled it. I found the date and read about an hour’s worth of material despite living through the darn thing 11 years ago. My search for the tornado lead me to Google Images which brought me to generically searching for images of Buffalo Lake. 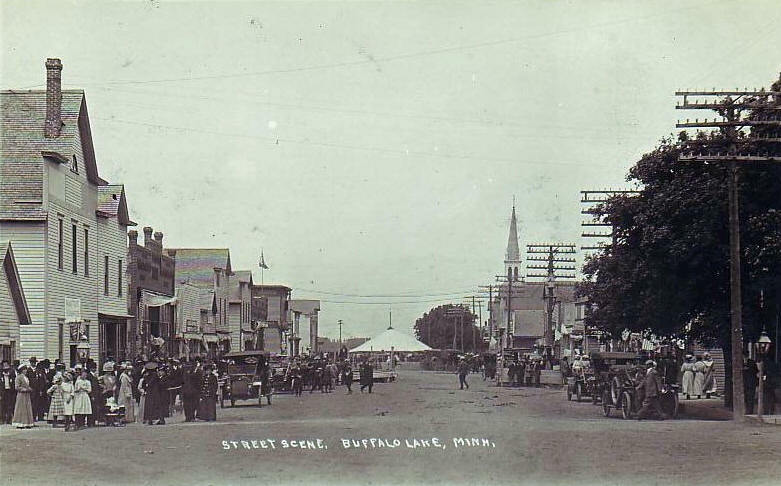 This first actual picture that is seen is a shot of Main Street from 1908. I’ve seen this picture multiple times, but never investigated more. Eventually, I landed on the Minnesota Historical Society’s website and multiple images of my hometown that I had never seen. Instantly an image jumped out to me. 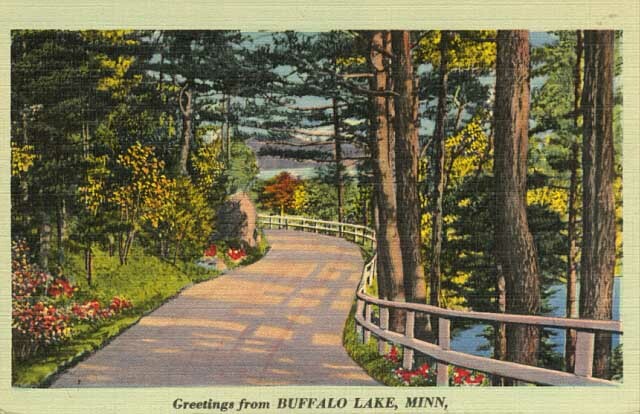 A lovely postcard illustration of what Buffalo Lake, the actual lake, used to look like. 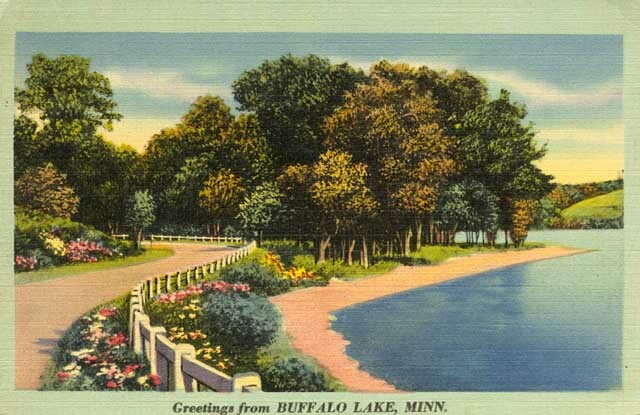 The Minnesota Historical Society says that the postcard is from the 1940’s, but Buffalo Lake’s official website says that Renville County drained the 40-acre lake sometime in the 1920’s to provide more acreage for farmers. It took my interest because I instantly knew where this was. I haven driven by that location a thousand times, but my whole life it’s been a field. Sometimes during a wet spring, it has looked like a lake, but by my Google Earth approximation this is where the illustrator was standing all those years ago. I don’t know how embellished this drawing is. I find it hard to believe that we had well-manicured flowers right along the roadway and that the shoreline was that perfect, but maybe our work ethic has fallen off that much even here in the hardworking Midwest. My formula has the hill that you see on the left hand side of the postcard being where the cemetery on County Road 8 is currently. The hill across the lake is now the trees that are located across the field. County 8, the road that leads back home, has been straightened out over the years it seems. A second postcard popped up. All I can figure is that this had to be from a little further north than the initial one. I love my hometown. I still believe it’s one of the most beautiful little towns that I’ve ever set foot in, but in her younger days, oh boy, she sure was pretty.